Life Questions You and Me! : New Year, New Time, Best Starting...! Life Questions You and Me! Laugh as much as you breathe and love as long as you live ! Listen to the art of being Successful, which says, Be Genuine, Be Yourself ! New Year, New Time, Best Starting...! After having created my blogger account, this is the first blog post from me officially, though I've spend...ah...no...wasted invested lots of time up in Internet, I suddenly got a feeling to start up from here, its New Year, its 2010, Well Starting from wishing all thru the world's most common and the most popular medium feels good....I don't know what will others will think of this....but now finally started.....Well wish me luck guys.....! 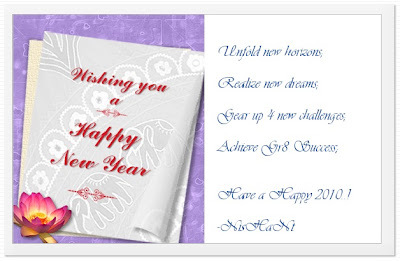 Have a Cheerful, Successful, Fruitful and Wonderful 2010 ahead....! गहरी कैद में छुपी हुयी जिज्ञासा को समझने के लिए एक परोपकारी द्रष्टिकोण . . .
आशावादी विचारों के सकारात्मक आदान-प्रदान कि खोज ! Delete your history from public places..! How to Improve Your Memory & Exercise Your Brain..! Mindblowing pieces of Hindi Daily! Electricity, a much serious matter..! Disclaimer © 2011-2014 LQYM. Travel theme. Powered by Blogger.